links The War Of The World official web site. You need to sign up to enter. 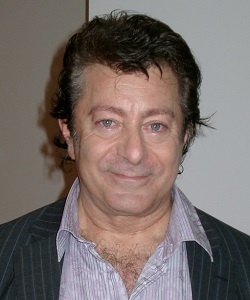 I've heard Jeff Wayne doing lots of TV commercials, jingles, as we call them before I worked with him with David Essex, and he's a very, very original arranger, his concept of sound is - he's the first person I've worked with who worked with a synthesizer. And in those days, you couldn't program synthesizers, you had to adjust every day and every day the sound would be different, because the electronics would change with the tempertures and stuff, and you couldn't get a preset where you'd get the same sound day after day. It would use incredible patience and also could only do one tone at a time. So if you wanted a harmony part, you would have to do it twice. So he used to work with very original, primitive synthesizers in the mid 1970's, and he was a pioneer of that - also lots of strange effects. I remember once he had Ray Cooper lowering a gong into a tank of water just to get an effect, and of course he recorded live on the tracks when we were doing the rhythm section. And he is full of interesting ideas and his arrangements in the records he made with David Essex are really great to my ears.